When the hot weather arrives, stay cool and collected by maintaining the health of your air conditioning unit, and easily learn how to clean AC coils yourself. An air conditioning unit is made up of several parts – one of which is the coil. Your AC can’t produce cold air in the same way that an electric heater can produce heat; instead, it must rely on the process of evaporation and condensation and this is where the coils come in. The evaporator coil is made of metal and is responsible for absorbing heat. Coolant is passed through the evaporator coil as gas, while at the same time, the fan draws warm air around the coil, turning it cold. The condensing section of your AC unit contains the condensing coils and these work by containing the now gaseous coolant and releasing the heat held within, expelling it from your home. An AC unit must have effective evaporating and condensing coils in order to work. If either type of coil gets dirty, your air conditioning won’t work properly. Regular maintenance of your AC coil is essential, and you don’t need to hire a professional for the job. Read on to learn how to clean and maintain AC coils yourself. Recommended Article: Find out all about window AC units in this guide. Evaporator coils are one-half of the essential parts that make up your AC unit and can be found in the indoor part of your system. Over time, these coils are naturally inclined to have a build-up of sediment and become dirty, which can cause problems with their functionality. If there is a high buildup of dirt, over time they will become damaged and need to be replaced, which can be expensive and inconvenient – especially during summertime. One of the best ways to look after the health of your evaporator coils is with a simple homemade AC coil cleaner. You can buy ready-made coil cleaners from most DIY shops, but you can also create your own solution using a few common household ingredients – a much cheaper and more convenient option. To make your own DIY AC coil cleaner, there are a few options available to you – firstly, you can use a simple wash of warm water. If this doesn’t remove the dirt, use a light solution of water with dishwashing soap or detergent. Another way to clean your AC coils is with a gentle scrub made from liquid dishwashing or hand soap mixed with a little baking soda. Recommended Reading: Live the quiet life with our guide to “silent” portable AC units. Take your homemade coil cleaner and use a soft brush – either one from your vacuum cleaner or you can buy a cheap one at the store – and gently clean the coils, being careful not to bend them or scrub too hard. Performing this maintenance once a year or so can dramatically improve the health and increase the lifespan of your AC unit, and takes just a few minutes of your time. The condenser coils are found on the other component of your air conditioning system – the part of the unit that can be found outside the house. This is where the coolant, which at this stage in the process has become compressed into a hot gas, is blasted with cool air from the condenser fan. The condenser coils then cause the coolant to lose heat and release unwanted warmth away from your house. Condenser coils can become damaged and less functional if a layer of sediment and dust is allowed to build up. If the external surface of the coils becomes too clogged up, it will become harder and harder for your AC unit to perform properly, as the heat will not be released effectively from the coolant. As well as dirt, your condenser unit may also become frosted up. If there is a layer of frost on your condenser coils, this too will prevent the system from working correctly. 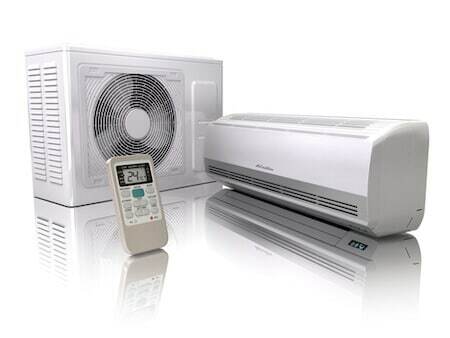 Recommended Reading: We cover small air conditioners in our new AC article. Cleaning your condenser coils is an essential process – and a very straightforward one too. One of the easiest ways to clean excess dirt from your unit is with a gentle flow of water from a hosepipe. You can also use a homemade condenser coil cleaner to remove any stubborn debris that water alone can’t remove. Just like the homemade indoor coil cleaner for the evaporator section of your unit mentioned above, it is very simple to make your own without having to go out and buy the ingredients for this purpose. Make your own solution by mixing warm water with a little detergent. Apply with a sponge, or by using a spray bottle, wait for a few minutes to allow the solution to soak in, and use a soft brush to remove dirt and ice. Again, if the buildup is stubborn, you might find that using a gentle dry scrub first can help. Mix soap with baking soda to create a gentle yet effective cleaning solution for your outdoor AC coils. Using a homemade coil cleaner once a year or more is one of the easiest and most cost-effective ways to prolong the life of your AC unit. This will save you money on repairs and replacement of your unit in the future. It will also provide you with more effective and efficient air conditioning unit, keeping you nice and cool during hot weather, and saving you money on your energy bill. Keeping the coils clean is one of the most important things you can do to prolong the life of your AC unit, but there are a couple of other things you can do too. Keeping the air filters clean is also important, as effective airflow is essential to full functionality and heat removal. Perform an air filter clean once a year or so as part of your annual AC maintenance. 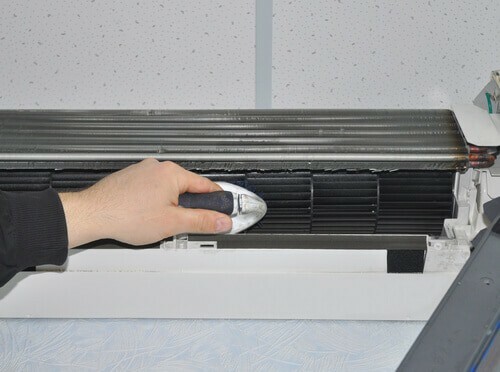 Another way to make sure your AC unit is working effectively is to ensure that the coil fins are straightened and not bent, as this can impact the airflow too. You can also check to make sure there’s enough coolant in the system for efficient operation. We hope you’ve found this guide to cleaning your AC coils helpful. 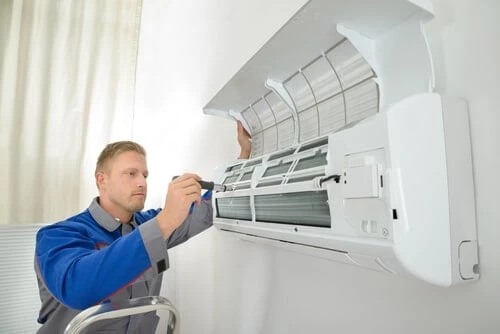 As with many home DIY practices, it isn’t difficult to maintain your own AC system without professional help. Clean your coils once a year, and you’re sure to enjoy a healthy and effective air con system for years to come. Follow us on Facebook and Pinterest to see more useful guides like this!